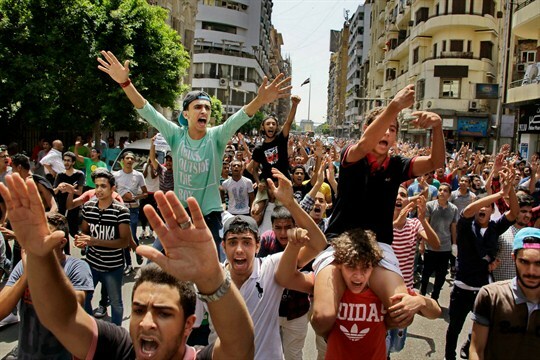 Egyptian students chant slogans during a protest against the cancellation of high school exams, Cairo, Egypt, June 27, 2016 (AP photo by Ahmed Abd El Latif). A baby boom in Egypt since 2011 has added 11 million people to a population that is now approaching 100 million, according to Bloomberg. With a quarter of Egyptians between the ages of 18 and 29 unemployed, and an increasing number of young people entering a labor market that is ill-equipped to absorb them, many experts are raising concerns. Egypt isn’t alone. Across the Middle East, overwhelmingly young populations coupled with a lack of economic opportunity have fueled unrest that could continue. In an email interview, Jack Goldstone, the Virginia E. and John T. Hazel professor of public policy at George Mason University and an expert on demographics, explains what is driving the baby booms in Egypt and the wider region, their potential political impact, and how governments are responding.